The masonry style was the earliest of the four styles. With this style the artists tried to give the walls the looks of rich colorful slabs of marble, brick, or block. This type would also be blended with the use of actual molded architecture columns and moldings. The next style was wall painting of the illusion of landscape, cityscape, and architecture. In this style no moldings were used for the architectural elements. It was all purely painted. A lot of these paintings gave you the illusion of looking out of a window or porch into a beautiful landscape. In this particular example the artist created a sense of expanded space by painting a away the walls. You are looking directly out into an idealized garden. 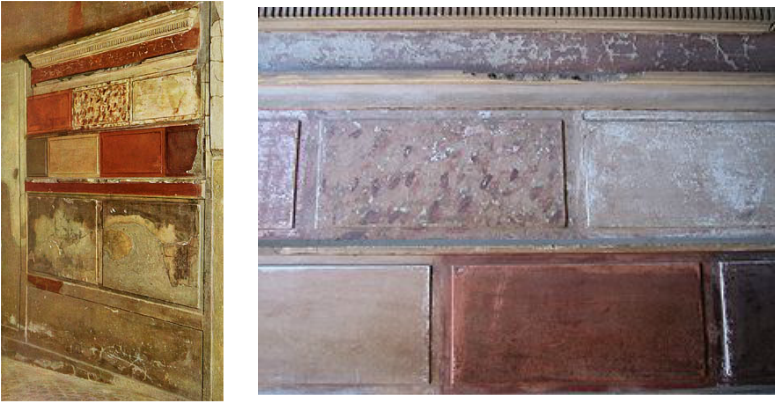 This wall scene was found at Livia's Villa at Primaporta. This particular view is more so a view from a window. The architecture is painted in as is the columns are holding up the window structure allowing you to look out into the landscape. 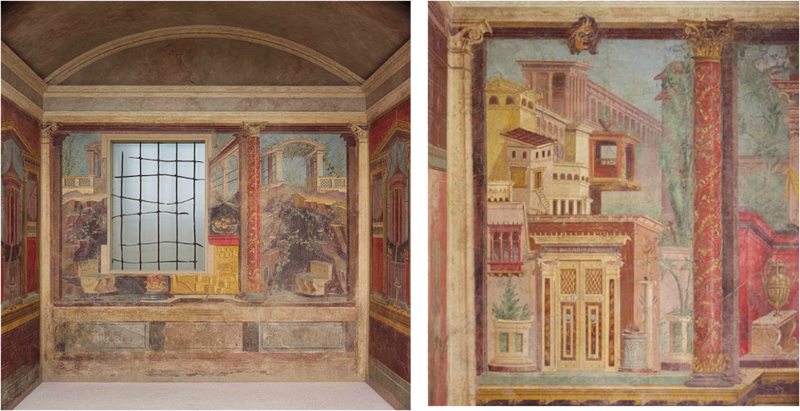 This wall painting is from the bedroom in the Villa Boscoreale. In this style artists cut out a lot of the illusion and realism they were using to create the spacial depth that they were doing before. This style you see more framed images that you have have hung upon your solidly painted wall, except they were actually painted frames. They did continue the use of some painted architecture style onto the walls but again the realism has been lost. The latest style of the four was the combinations style. In this style elements were used from each of the earlier styles bit it also incorporated a new element: staging. In this wall art you can see various aspects of the earlier styles with the use of painted realistic architecture, solid painted walls with hanging pictures, and the use of expanded space inside those pictures looking out into landscape or architecture. Another popular private theme in Ancient Rome can be seen here with the use of mythological characters.